Local residents will have two opportunities this spring and summer to support the Graham E. Smith Foundation, which funds Farmington area suicide prevention efforts. 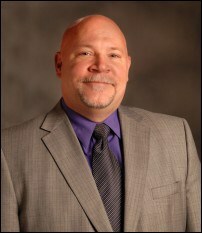 Founded by Farmington Hills council member Ken Massey and his wife, Katherine, the Foundation was created and named in memory of their son, who took his life in May of 2011. 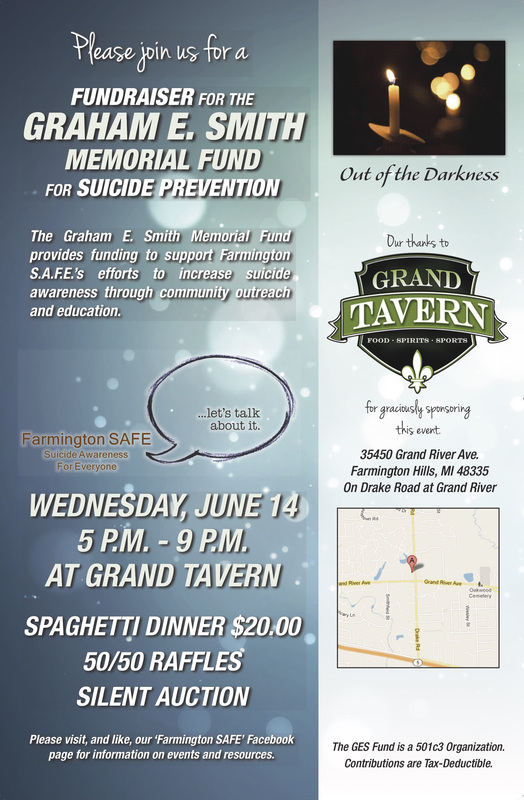 It supports Farmington SAFE (Suicide Awareness For Everyone), which has organized community conversations, guest speakers, and other activities to raise awareness and get people talking about suicide and depression. 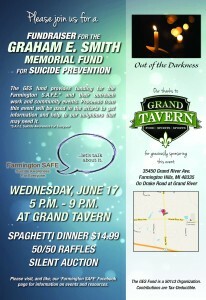 For a third year, Grand Tavern in Farmington Hills will host a June 17 spaghetti dinner, with proceeds generated from 5 p.m.-9 p.m. going to the Foundation. Ken Massey said the owners of the restaurant, located at Grand River and Drake Road, created the event, which will include 50/50 raffles and a silent auction. While there won’t be a formal presentation, suicide prevention information and materials will be available, Massey said. A second fundraiser in August will involve a lot more exercise than lifting a fork. 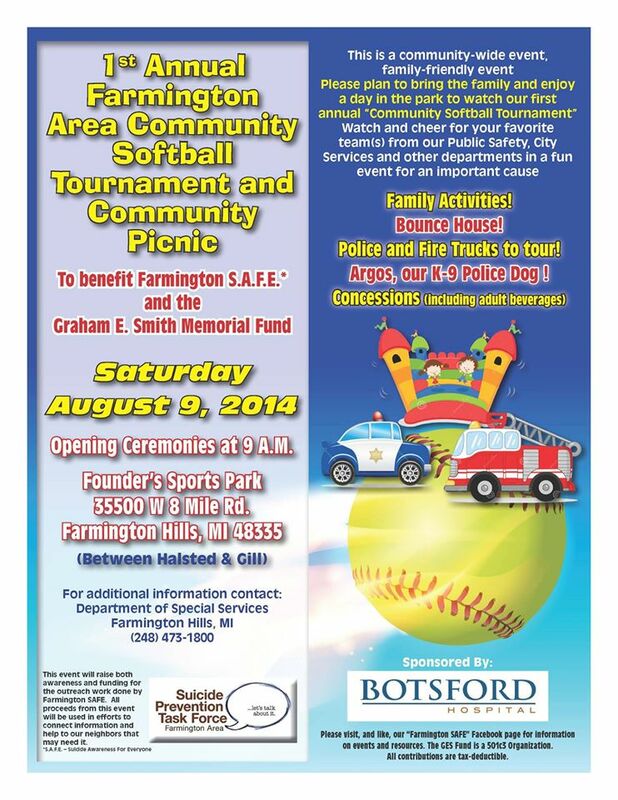 Farmington SAFE’s second annual softball tournament has grown much larger, from eight teams last year to about 20. As a result, the event has expended from one day to two this year, August 8 and 9. In addition, the City of Farmington Hills Special Services Department is helping to coordinate registration. And it will be a family event, with a bounce house and Farmington Hills Fire Department trucks on display. Massey said these events don’t have a particular fundraising goal. For more information, or to make a donation if you can’t participate in either fundraiser, contact Massey via email, kmassey@ameritech.net, or at 248-476-4448. 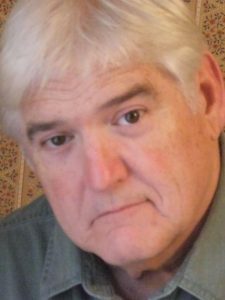 You can also learn more about Farmington SAFE at farmingtonsafe.com or on Facebook. August 9, 2014- Fun For the Entire Family! Do you want to be a part of history in the Farmington or Farmington Hills area? 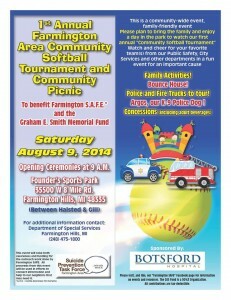 Farming Safe invites you to the very 1st Annual Farmington Area Community Softball Tournament and Community Picnic sponsored by Botsford Hospital! This fun-filled event will offer activities for everyone, young or old. Opening ceremonies will begin at 9 AM at Founder’s Sport Park located on 8 Mile Rd. in Farmington Hills. Regardless of what time you decide to show up, we highly encourage you to bring all of your family and friends for a day of fun, as well as knowledge about the importance of suicide prevention! This event will raise awareness within the community for suicide prevention, as well as funding for future outreach from Farmington S.A.F.E and the Graham E. Smith Memorial Fund. For more information, please see the flier below or contact the Department of Special Services Farmington Hills, MI (248) 473-1800.